It is essential to have quality landscape and outdoor lighting at your home as it will increase the property value and provide security and safety for your family and guests. Local homeowners know us as the experts in Greenville landscaping lighting because we have over twenty years of experience as a Leading Landscape Lighting Designer. Our employees are highly knowledgeable and trained to provide superior services and products for our customers. We provide a wide range of services to meet the needs of our customers. Epic Lights is the number one choice in landscape lighting. We can illuminate your landscaping to provide elegance and sophistication to your property. 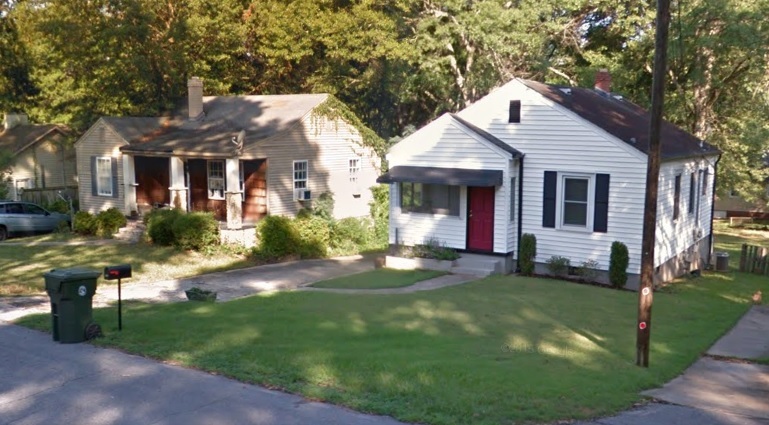 Greenville is the third largest area in the state with a population of 62,252. CNN Money ranked it as the “Top Ten Fastest Growing Cities in the United States” and Bloomberg named it as “The Third Strongest Job Market in the United States.” It was named for its beautiful physical appearance and was created in 1786. This place is a city that has natural beauty, adventure, and excitement. 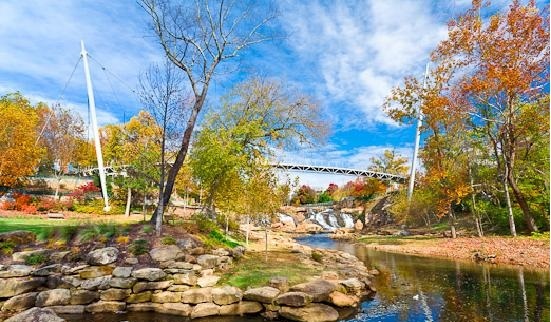 The Falls Park on the Reedy is located on the West End of Greenville and is the perfect location to see beauty. The Falls Park on the Reedy has a pedestrian suspension bridge that overlooks the Reedy River, waterfalls, gardens, and much more. Visitors should make sure they go to this park to see all the beauty located here. The city is home to several different festivals. The Fall for Greenville is a three day festival that has live music entertainment, food, games and is located on the streets of downtown. The festival is held in October and a great time to visit the city. The Greek Festival is a popular festival, too. The Greek Festival is held by the Greek Orthodox Church and is a three day festival that celebrates the Greek culture. Visitors can expect the delicious Greek foods, music, and drinks. Southern Blue Ridge Escarpment Gorges of the Blue Ridge Mountains is home to over three hundred rare species and fifty waterfalls. Visitors can visit the Southern Blue Ridge Escarpment Gorges to see the beautiful nature and wildlife that exists here. This city is a thriving, beautiful city that has something for everyone. Epic Lights is the outdoor lighting specialists that residents in Greenville contact for all their outdoor lighting. Contact us today to schedule a consultation. We were recently contacted by a hotel interested in hiring a skilled landscape lighting contractor in Greenville. They had just finished renovations of their outdoor patio and garden, and needed to discuss details with an landscape lighting designer for the finishing touches to the space. The hotel was interested in comparing a few options and wanted to hear our ideas for what might look best. We sent someone over to the hotel the next day to take a look at the space in need of outdoor lights. The area consisted of a stone patio off of the hotel’s restaurant with a number of tables and an outdoor fireplace, and a small garden with a path for guests to walk among the flowers and trees. It was a cozy and pleasant area, but badly in need of landscape lighting, especially the garden, which could get very dark at night. In addition to the hotel’s desires for landscape lights that would enhance the space and contribute to the relaxed ambience, they also wanted a landscape light maintenance plan that was both eco-friendly and cost efficient. We quickly came up with a plan that would satisfy all their desires aesthetically, monetarily and in regards to sustainability. The hotel, impressed with our plan, significant experience with commercial outdoor lighting, and our price estimate, decided to go forward with our outdoor lighting company. Our team got to work straight away on the hotel’s project. Per their desires for cost-efficiency and a lower environmental impact, we decided to use LED bulbs for the outdoor lighting. LED bulbs have a low-voltage and use significantly less energy than regular incandescent bulbs. They also generally have a longer lifespan. This saves the hotel money both with their energy bill and with replacement or maintenance costs down the line. For the landscape lighting design itself, we decided to place the landscape lights sporadically throughout the garden, so it wasn’t too bright and wouldn’t disrupt the relaxed mood of the space, but was also light enough to enable hotel guests to see where they were walking at night. In regards to the patio, we also wanted to maintain a casual mood for the space, so we kept the lighting low and warm to promote a comfortable and relaxed atmosphere for guests dining outside. When the project was finished, we met with the hotel again to ensure they were satisfied with the space, and also to discuss a regular maintenance plan for us to come back and check on the outdoor lighting system periodically to ensure it was functioning correctly. The hotel agreed to the plan and was pleased with our dedication to quality landscape lighting contractor work in Greenville. Overall they were incredibly enthusiastic about the results and said the outdoor lighting turned out better than they could have ever expected. Be Sure to Stay Updated! Visit this page often to learn more of our latest work installing landscape lighting in Greenville.